Paperwork deadlines in the rain! As I watch the Cherry tree divert the flood waters around it in our garden I have to wonder if it will survive this constant soaking of its roots or drown! 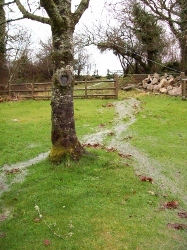 The farm fields are not much better with pools and small lakes appearing after heavy rain where grass should be. Much time is being spent by farmers around the country filling in their Soil Protection Review, deadline 31-12-12, to satisfy the powers that be that we are aware of waterlogged soils and are able to show how we will treat them! We have to identify each field by its number, describe its soil type, the use of the land, soil issues eg run off carrying lots of silt, do a risk assessment on the soil and identify measures to be taken if the soil has issues - that's just to mention a few of the items to be addressed. This is just one of the many forms, assessments, surveys and registers we have to keep for the government. Beware looking up on ladders! It’s good to be back on the net again. Many of my duties changed over the last few weeks after Miles’s had an accident, broke his wrist, dislocated a finger took a blow to the chin which broke a tooth and misaligned his jaw plus lots of scraps and bruises. I found myself back on the farm while he recovered managing to cover the stock work with the help of Luke, our son. While waiting at A&E it became obvious to us that blacking out and falling like a rag doll off a ladder, whilst looking up, (the ladder stayed in place!) is relatively common and a well known reason, to the medical profession, for this sort of accident. The big artery at the base of the skull gets squeezed and restricts the blood flow to the brain hence the black out. Having attended several sessions with the H&S folk why is it that the section on “safe use of ladders” has never flagged up this fact?